Obama's new NASA mission may not be sending anyone to the moon or Mars until the next decade, but they're preparing for the future in an undersea laboratory three miles off of Key Largo. 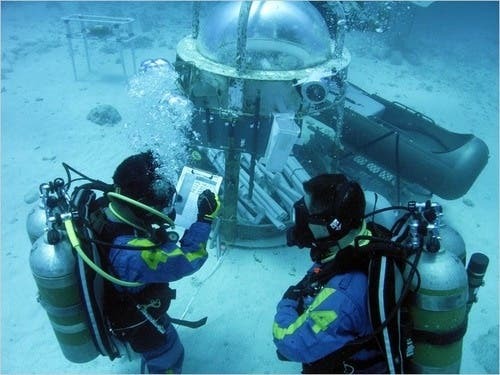 The NASA Extreme Environment Mission Operations—its friends call it Neemo—has been around for nearly a decade. This past Monday marked the kickoff of its 14th mission, sending six aquanauts down to the underwater Aquarius lab. During their two weeks in the laboratory, the aquanauts will go on simulated spacewalks, operate a crane and perform other tasks of the sort astronauts would face in setting up a base-camp habitat on another planet. "The primary objectives are based on engineering and testing and operations design for planetary exploration," said William Todd, the project manager for the Neemo 14 mission. Other particulars that authenticate the experience: the buoyancy of diving suits can be adjusted to reflect the one-sixth gravity of the moon of the three-eighths gravity of Mars. Communications are lagged twenty minutes, as they would be on a real Mars mission. The Aquarius Lab is owned by the National Oceanic and Atmospheric Administration and managed by the University of North Carolina at Wilmington, operating 5.6 kilometers (3.5 miles) off Key Largo in the Florida Keys National Marine Sanctuary. 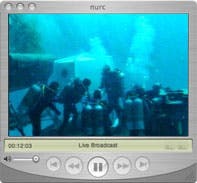 It is deployed next to deep coral reefs 62 feet (19 meters) below the surface. The laboratory is most often used by marine biologists, for whom Aquarius acts as home base as they study the coral reef, the fish and aquatic plants that live nearby and composition of the surrounding seawater. Aquarius houses sophisticated lab equipment and computers, enabling scientists to perform research and process samples without leaving their underwater facilities. Because of the current debate between manned or robotic space flight in upcoming Senate Committee on on Commerce, Science, and Technology hearings on that future, it's important to know that we're prepared for whatever space exploration mission we eventually undertake.